A Camera Designed To Take And Send GIFs (Bring Your Own Cat) : All Tech Considered With this retro-style camera, users will be able to take and send their own GIFs by simply cranking a knob. Our Weekly Innovation pick does not settle the debate over how to pronounce GIFs. Courtesy of Next Thing Co. The OTTO will sell for $199. The selfie may be nearly over, but animated GIFs most certainly aren't. Now, making and sending GIFs can be easy as cranking a knob with a new retro-styled camera called OTTO. The bright blue gadget just launched a campaign on Kickstarter. "To make a GIF, simply turn a rotating crank that pops up from its top—it would then send the GIF over to your smartphone, making it easy for you to share it on social media and with friends. In addition to GIFs, it is also able to produce 'time lapses, impromptu photo booths and something brand new'." The designers, Thomas Deckert, Dave Rauchwerk and Gustavo Huber, call it the first product to turn a traditional camera into a GIF-maker. But it does more than merely taking GIFs. The app that comes along with the device lets you choose on your smartphone all sorts of different capture modes like time-lapse, photo booth filters and user-generated modes found in a community library. OTTO is one of the early commercial products built on the Raspberry Pi, a low-cost, credit-card-sized computing platform. 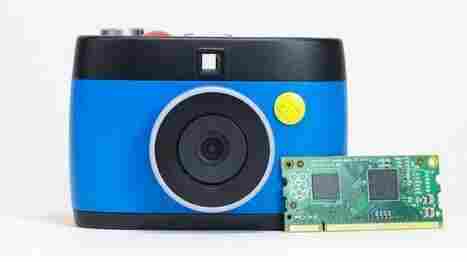 Using Raspberry Pi allows these cameras to be "hackable" or customizable, for the tech-savvy. "OTTO's modes have tons of detailed settings that you can adjust from inside the smartphone app," the designers explain on the Kickstarter page. "Without any special skills, you can completely change how OTTO's modes react to your input. Once you've made your tweaks, your settings are automatically sync'd to OTTO." OTTO will sell for $199, or you can get one by pledging at least that amount. The cameras are expected to ship in December.